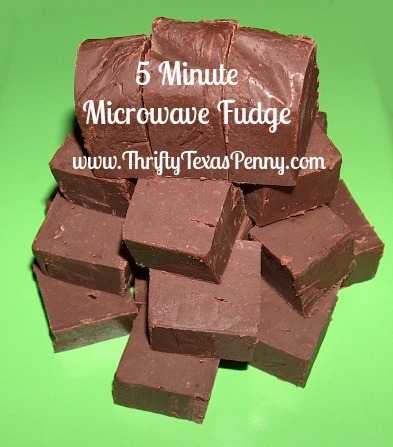 Microwave fudge is the easiest and quickest way to make your own fudge. It takes just 3 ingredients and 5 minutes to prepare. You can’t go wrong with this one! 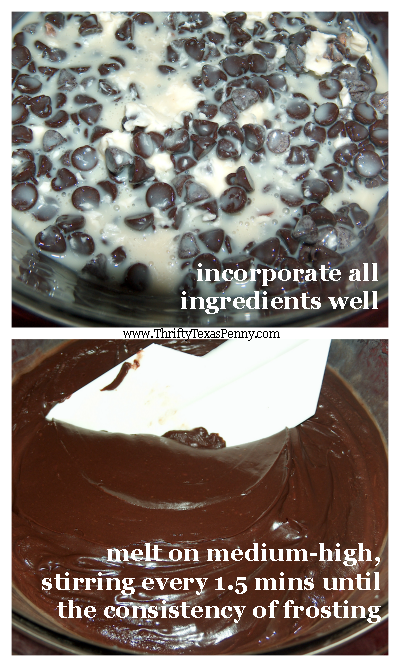 Put all ingredients in a large glass bowl so you can see through to be sure everything melts evenly. Incorporate together very well. Melt in the microwave on medium-high for 1 and a half minutes, then stir well. Do this 3 times. It should look very much like a container of frosting when it’s fully melted. It’s very important to not overheat, as even 5 seconds can burn your chocolate! Meanwhile, line an 8×8 glass dish with wax paper and grease bottom and sides with the margarine stick foil. Pour melted ingredients into your dish and smooth or pattern as you like. Be sure to poke the chocolate into the corners well or you’ll end up with empty corners on the bottom. The next morning you’ll be able to lift the fudge out by the wax paper, flip and slice. I use a very large knife so that I can cut all the way across. Store your microwave fudge in the refrigerator if you want it to stay firm, or covered at room temp if you like it chewy. See – Didn’t I tell you that was incredibly easy? You can add nuts either by sprinkling over the top before chilling or mixing in after the melting. I prefer pure chocolate sweetness, so – ahem- I don’t add nuts.